Still didn’t got a chance to buy Xiaomi Mi3 you can wait for the next sale which will start on August 26th, but registrations are already opened, and you can just start register for an account! 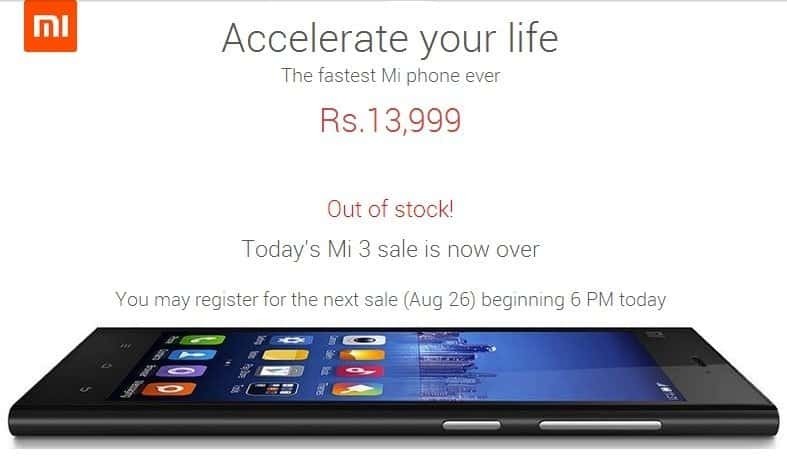 Xiaomi has been setting records in India, with the flash sale of their Mi3 via Flipkart and today was no exception. Today, the fifth sale was scheduled at 2 PM, a 20000 Mi3 smartphones were available for sale. But within seconds all of them got sold out. Some users could not even make a click and the device got sold out. Earlier, Flipkart was acing some problems with this type of flash sale and its website crashed in the past week, but today everything went well as Flipkart managed to pull off another quick sell-out. The next sale will be on August 26th and users will have to register again to be eligible for buying this phone. The registration will start at 6pm today. So, if we take the numbers to be accurate, til now Xiaomi has sold 70000 Mi3 smartphones till now via Flipkart. The first day, it reportedly went off shelves within 40 minutes, while the second batch sold in five seconds, and the third one at a record of less than two seconds. and we explained cleraly regarding every sale here Even with the evident demand, Xiaomi has been releasing meagre units though there are alternatives to Flipkart, we have already updated that. You don’t nee to buy via Flipkart and need all these hassles, you can directly buy without waiting. Read our previous post. we are coming with more tips and tricks to buy xiaomi Mi3 for the next sale on August 26th, do comment if you get Mi3 today ?